"The Glass and steel French doors open from the foyer into the main living are, a great, open and flexible space." "The eat-in kitchen area is open to the sizable gourmet preparation kitchen and family room." WESTPORT — A drive through the streets of tony Westport reveals a range of houses from newly constructed 10,000-square-foot mansions to tear-downs waiting to happen to older homes that, in the right hands and with the right modifications can be spared the wrecking ball. Such is the case of the re-imagined white contemporary ranch-style house at 34 Jennie Lane, which sits on a 1.25-cre level property in the Compo South neighborhood. The house could be defined as new construction with a twist. A large portion of the original house was preserved. “Another home saved, restored and rebuilt by CCO Habitats,” according to the website for the Westport home builder, which was responsible for the work. “We genuinely enjoy preserving Westport’s character one house at a time,” said David Vynerib, founder and president of CCO Habitats. The company has won two Home Building Industry, or HOBI, awards, including one in 2017 for Best Renovated Spec House for this 5,236-square-foot residence. This is really “a California contemporary-style house with a warm Connecticut vibe - open and casual, light and bright, with a killer first floor master suite,” according to the listing agent, who further defines the house as “comfortable sophistication.” Most of the house is on one level but there is a second floor in one section that holds two of the bedrooms. Before its transformation this house comprised a bunch of dark rooms. Its new incarnation has an open, flexible floor plan with lots of natural light and five bedrooms scattered throughout the home; “perfect for the buyer not looking for a traditional box,” the realtor said. During a recent open house event it wasn’t just prospective homebuyers who stopped by. Several neighbors also did a walk-through, their mouth agape as they did. “I knew this house before (its transformation). The shape is the same. From the street it looks the same. Inside it’s completely different. It’s amazing they can do this,” one neighbor said. Others talked about the close-knit neighborhood and said the next owners have more than a beautiful house, property, and in-ground swimming pool to look forward to. Residents of the street get together every year for a local block party. The fun activities continue year-round. This is a water community and residents can walk to Longshore Country Club and Compo Beach less than a mile away. It is also an easy drive to the Saugatuck train station and I-95 for commuters. There is a long semi-circular driveway lined in Belgium block in front of the house with ample parking for visitors there and on the street. A wide granite path, also bordered by Belgium block, leads to the covered front entrance. From the foyer glass French doors lead into a great, open space, where the living room is to the right, the dining room is to the left and the eat-in kitchen is straight ahead. The hardwood floors throughout are cerused, a bleaching technique. "The master bedroom has a tray ceiling, walk-in closet, and a spacious bath." "In the backyard there is an in-ground swimming pool and professional landscaping with many flowering perennials." In the living room there is a vaulted ceiling, bay window, and a double-sided fireplace in the center of the room. The other side of the firebox opens to the family room, which has two skylights and French doors that open to the sizable bluestone patio and attractive backyard and its established landscaped gardens with an abundance of flowering perennials. There is also plenty of flat grassy yard as well. The eat-in area of the kitchen features a walk-in bay window area and a dry bar with a beverage refrigerator. In the kitchen the features include a center island/breakfast bar topped in a thick slab of marble. The perimeter counters are also marble. High-end appliances include a Thermador six-burner range top. One wing of the house contains the master suite, and office, and another en suite bedroom. The other wing has another bedroom, mudroom with built-in cubbies, full bath and laundry room. This area of the house provides access to the attached three-car garage, a door to the backyard, and the stairs to the second floor and to the basement, the latter of which has flexible use finished space with wall-to-wall carpeting. The laundry room has a sink and it is large enough to double as a pantry. The master bedroom has a tray ceiling, walk-in closet, and a spacious bath with a vaulted ceiling, skylight, and free-standing soaking tub. NORWALK — With slick suits, skinny ties and dominant personalities, the advertising executives of Madison Avenue in the 1950s and ’60s — the Mad Men — are some of the most romanticized characters of the modern era. And they’re exactly the type of people who might have lived at 8 Dogwood Lane in Westport, at least in the imagination of architect and owner David Vynerib, principal at CCO Habitats in Westport. Vynerib, a veteran in real estate development and redesign, acquired the home from the estate of Susan Malloy, a beloved Westport artist and philanthropist who died in April 2015. As a Westporter himself, Vynerib never had any intention of living in the home, and instead purchased it specifically to renovate. “It was really important to me to keep it and not knock it down so we could keep the character of the town,” Vynerib said. The property is on the market for $2.2 million through listing agent Maryann Ross Levanti of Higgins Group Real Estate. Levanti said the home appeals to a growing pool of buyers who aren’t looking for a cookie-cutter house. The home was originally designed by Aaron Resnick, a student of famed mid-century architect Frank Lloyd Wright. With it’s quirky geometric shapes, hard lines, flat roof and unusual floor plan, the 1950s construction had hardly been updated since it was first built. Malloy purchased the home in the mid-1980s and added an indoor swimming pool, which she was known to swim in even in her later years, and kept her studio in what is now a home office. Though Malloy meticulously maintained the property, it was dated and at risk of becoming the latest victim in a string of mid-century teardowns. While most of the renovations revolved around resh coats of paint and modern appliances, Vynerib expanded the kitchen, added a modern master bedroom and moved a few walls around. The gray walls and stark white built-ins give the home a sleek feel reminiscent of something Don Draper might have called home. “We tried to make it as Mad Men-esque as possible," Vynerib said. Vynerib made special efforts to preserve the original built-in cabinetry throughout the home, as well as a set of stained glass windows in the entryway. The indoor pool and spa was converted to salt water, and the updated master suite took advantage of the unusual original lighting and large windows to create a dramatic bedroom that overlooks the private yard. Vynerib got his start as one of three founders of Citi Habitats, the largest real estate sales and rental agency in New York City. After leaving the business, he opened CCO Habitats in Westport, and set to work renovating one-of-a-kind homes and building new ones. 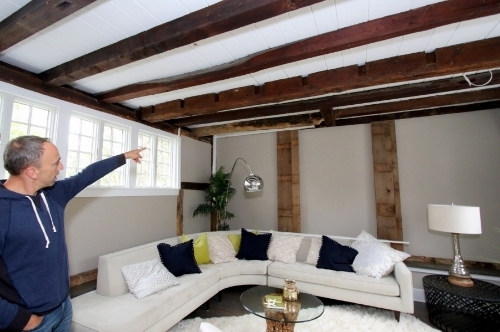 In 2015 the Home Builders and Remodlers Association of Connecticut awarded CCO the “Best Antique Home Restoration/Historic Rehab” for their preservation and reimagining of a circa-1802 property in Westport. And, although he has ample experience in renovations and new construction, Vynerib said the home at 8 Dogwood is his first mid-century modern renovation, and by far his favorite to date. Levanti said it’s important that more builders and buyers recognize the architectural significance of Westport’s shrinking pool of unusual homes, particularly those built in the middle of the century. Located in one of Westport’s more architecturally diverse neighborhoods, just off Compo Beach Road, the home blends in with the landscape while still making a statement about the time it was constructed. As seen in the April 2016 Greens Farms and Compo Neighbors Magazine! WESTPORT — Famed architect Frank Lloyd Wright incorporated his architectural masterpieces into a site’s natural surroundings, often including waterfalls, streams and natural pools of water. A water element figures prominently in the smoke-colored ranch-style house, at 8 Dogwood Lane in Westport, which has an indirect connection to Wright. This house has a large pool house — attached to the main house — with an indoor swimming pool, spa and entertainment center with a wet bar. It is easily accessed from the lower level family room creating a large entertainment space that continues into the attractively landscaped, Zen-like, 1.4-acre property. Dogwood Lane is a private road, which has 20 lots with a mix of architectural styles including a Frazier Forman Peters stone house, mid-century moderns and large new colonials. The house was originally built in 1954 as a mid-century modern designed by Aaron Resnick, a disciple of Wright who put the architect’s theories into practice, according to Resnick’s Nov. 1, 1986, obituary in the New York Times. In the last year, the original structure was partially demolished and rebuilt to create a 21st Century home using a design that maximizes its minimalism. The shell is basically the same, but the new configuration added square footage to accommodate a gourmet kitchen and private master suite. Some walls were moved and some spaces were re-imagined. The house has 4,200 square feet of living space, not including the pool house. Several skylights bring natural light into the house. The wood floors were bleached and stained. “The transformation is amazing,” one neighbor said during a recent public open house. There is local interest and value to the house as it was the long-time residence of one of Westport’s cherished daughters, the late Susan Malloy, an artist, arts patron and philanthropist. It’s fitting then that the major renovation transformed the structure into a work of art. The entrance features five glass panels of stained and beveled glass. Inside, a long hallway has four floor-to-ceiling windows covered with a decorative contemporary wood framework. With its open floor plan, the living and dining rooms share one large space that has a vaulted ceiling and cove lighting. One concrete wall houses a wood-burning fireplace. The living room also has two separate doors to the wood deck and backyard, and a wet bar and beverage refrigerator. There is a second wet bar in the pool house. The kitchen’s features include a large marble center island, marble counters, a cathedral ceiling, eat-in area with a door to a wrap-around wood deck and custom cabinets. It has a Viking Professional six-burner range, Viking double ovens and Sub-Zero refrigerator. One room has flexible use as an office, den or gym. It is positioned on its own level between the main and lower floors. The main level has three en suite bedrooms, the first of which has a tray ceiling, a wall of floor-to-ceiling windows and a door to the same sizable deck that can be accessed from the living room. The master suite has two walls of windows and four separate doors to a long private balcony/deck that wraps around on three sides, cathedral ceiling, cove lighting and gas fireplace. In the master bath the floors are heated. There is a free-standing soaking tub and large shower stall. A fourth bedroom is found on the lower level between the family room and pool house. It has wall-to-wall carpeting and a sliding door to a large bluestone patio. Outside this bedroom is a full bath, which is also near the pool house. The pool house has three sliding doors to the stone patio. Although the house is close to the Post Road (Route 1) and downtown Westport, one would never know it. Dogwood Lane is within easy walking distance to the Caryl and Edna Haskins Nature Preserve on Green Acre Lane, a 16-acre sanctuary administered by the Aspetuck Land Trust. **Also seen in Westport News. Framed by historic stone walls and with a more than 100-year-old sugar maple tree in the front yard, the 2,700-square foot combination farmhouse/Colonial at Westport’s 158 Hillspoint Road goes on the market today for $1.795 million. Over the 18th and 19th centuries, this home—which is a stone’s throw from the Mill Pond and an ambitious walk to Compo Beach—has grown up and out, each new section a portal to a different time. In addition, there is a 300-square foot separate studio replete with a full bath and fireplace behind the house and adjacent to the 12 feet by 30 feet pool. Westporter David Vynerib, who purchased the home in February for $900,000 to restore and resell it, seems to marvel at every room he walks in, the wood planked floors recently highlighted with walnut stain. Vynerib enthusiastically points out the opened up kitchen, the grand sunroom, the four bathrooms, one with Italian tile, the four bedrooms and the new mantel around the master suite fireplace. But the room that fascinates him the most is the family room and the bedroom above it on the southern portion of the home. “This is the magic of this house,” he said about the 22 feet by 16 feet room. It had been a barn built in 1802. The former barn was the house’s starting point, the spot from which it grew. Vynerib’s determination to showcase it won him the admiration of the Westport Historical District Commission (HDC), anxious to preserve the town’s historic inventory in a era of teardowns. On a recent visit, HDC Chairman Francis Henkels seemed pleasantly surprised. Vynerib said he was taken with the room’s past, particularly the hand hewn, brown, rock solid beams extending across its ceiling. As developer, the problem Vynerib faced was that the room was too low to transform into a family room. Rather than lose the beams by going up, Vynerib explored the next best option, going down a few feet. So, he lowered the floor. “We were originally going to go up,” he said, but noted that losing the beams was not an option. So, the contractors dug beneath its original stonewall foundation, shoring it up with a cement one. The end result is a sunken family room with the original beams overhead and a step up to the original fireplace facing room’s north side. “This was the barn to a house on the corner,” he said. The barn was most likely used to store horses. There is a section of ceiling that appears to have been cut out and re-planked. Vynerib said that is where stairs used to be. They led to a hayloft, now a bright painted bedroom, the hand hewn beams looking like white floorboards. Now that the 1802 room has been confirmed by the WHS and saved, Vynerib said another interesting study awaits the new owner—discovering how the home evolved, chronicling each section as it grew throughout the town’s history. A house built at 5 Berkeley Place in 1960 was recently razed and a Contemporary-style home was constructed in its place using the original footprint. The house is tucked away at end of a cul-de-sac off Berkeley Hill, off Berkeley Road in the Coleytown area. It sits on a one-acre level and sloping property that enjoys privacy. The open concept floor plan coupled with its numerous oversized windows and skylights provides a wealth of natural lighting throughout and an abundance of attractive views of the woodland setting and landscaped lawn and gardens. The property includes natural outcroppings of large rocks and man-made fieldstone walls visible from almost every room. That setting also includes a heated in-ground vinyl swimming pool, bluestone patio and wood deck. A long driveway and parking area is ample for entertaining. A bluestone path leads to the front door, which has tall sidelights. The white exterior of the house consists of vertical wood boards. Inside, there is 3,300 square feet of living space on three levels. Enter the house into a wide foyer that is large enough to use as a sitting or music room. It has a tile flooring that resembles wood. This lower level allows for flexible use of space. It has a bedroom with a full bath for an au pair or guest suite and the media room can be used as a playroom, gym, office or a fifth bedroom if needed. The laundry room, mudroom with four built-in coat cubbies and other storage, and access to the two-car attached garage are also on this level. On the main living level the kitchen is the centerpiece around which are two very large, open rooms with ceilings at least 10 feet tall. To one side of the kitchen the large open space holds the formal living and dining rooms. To the opposite side that large space comprises the family room and eat-in area for casual dining. The family room has a fireplace with a marble surround. This level has pegged hardwood flooring. A large, wide center island separates the kitchen from the family room and eat-in area. Kitchen features also include marble counters and backsplash and a long rectangular stainless sink. High end appliances include Bosch five-burner range top and Bosch double wall-mounted ovens. The kitchen looks out to the patio and pool. To access the remaining three bedrooms climb the stairs and cross a "bridge" with wide planked wood flooring over the foyer. The master bedroom suite is large enough to have a sitting area and there is a door to a large, private wood deck for a peaceful retreat and rooftop garden. The master bath has a soaking tub by a wall of windows, walk-in shower and a double vanity. This house has plentiful storage including in the garage. For more information or to make an appointment to see the house, contact Maryann Ross Levanti of Higgins Group Real Estate at 203-984-5157 or email her at maryannross@aol.com. Additional information is available at www.5berkeleyplacewestport.com. The stretch of Hillspoint Road from Hales Road to Old Mill is not an official historic district. But plenty of older, handsome homes line both sides of the street, as it dips gently from I-95 and the railroad down to Elvira’s. For a long time, a “demolition” sign seemed to doom 158 Hillspoint Road. But the other day, Fred Cantor — who in addition to being an alert “06880” reader is also a very alert neighbor — noticed the sign was gone. He spotted contractors’ trucks on site. So on one of his walks he talked to a next door neighbor, and a worker. Both confirmed that the home was sold, and will stay. Fred is not content to just spread the good news. He also passes along the history he’s dug up. According to tax assessor records, Fred says, the original portion of the home was built in 1803. Fred found information from former owner Sue Braley on WestportNow in 2013, when it was first slated for demolition. Sue — who sold it in 1996 — said it was originally an outbuilding of the Sherwood House at 160 Hillspoint, then modified for human occupation in the early part of the 20th century, when artists and others began coming to Westport for the summer. Oral tradition claims that it was a tea room for the tourists, perhaps operated by Edith Very Sherwood, who lived at 160 and was the Westport librarian. (A subsequent owner was) Richard Seyffert, a portrait and landscape painter who began construction of the studio toward the rear of the property. Felice Holman Valen (the author of over 20 children’s books, including “Elisabeth and the Marsh Mystery” and others clearly inspired by the nearby mill pond) and Herbert Valen (who worked in advertising and later as a “gag” writer for the New Yorker) owned the property from 1955 to the late 1980s. Westport’s old homes are disappearing at an alarming rate. How nice to read of at least one that escaped a very imminent wrecking ball.